On Friday my husband had arthroscopic shoulder surgery to due to arthritis in his shoulder. He has done very well, just 2 little incisions, that could be covered with band aids, after the initial dressing came off. He has had very little pain, and is regaining the movement in his shoulder. He had a nerve block, so he didn't have to have a general anesthesia. which has hastened his recovery. Cacciatore refers to a dish cooked "hunter style" with mushrooms, fowl, onions, tomatoes, and wine. Now Giada's recipe didn't have mushrooms, but next time we will add them. We also didn't add the capers, because they are high in sodium. Also, the sauce seemed a little thin, so we might thicken it a little bit more, when we reheat it. That's the beauty of one pot meals, that they make quite a bit, and are good for leftovers. The sauce does have a wonderful flavor, with the garlic, herbs, and wine, which went well with the cooked chicken. We will definitely make this again. 1/4 cup coarsely chopped fresh basil leaves or 1 tsp dried basil. Sprinkle the chicken pieces with 1 teaspoon of each salt and pepper. .Dredge the chicken pieces in the flour to coat lightly. In a large heavy sauté pan, heat the oil over a medium-high flame. Add the chicken pieces to the pan and saute just until brown, about 5 minutes per side. If all the chicken does not fit in the pan, saute it in 2 batches. Transfer the chicken to a plate and set aside. Add the bell pepper, onion and garlic to the same pan and saute over medium heat until the onion is tender, about 5 minutes. Season with salt and pepper. Add the wine and simmer until reduced by half, about 3 minutes. Add the tomatoes with their juice, broth, capers. if used, and oregano. Return the chicken pieces to the pan and turn them to coat in the sauce. Bring the sauce to a simmer. Continue simmering over medium-low heat until the chicken is just cooked through, about 30 minutes for the breast pieces, and 20 minutes for the thighs. Nice of your hubby to get in the kitchen and cook so soon after surgery! Lucky you to have come home to such a great meal. Weird that Giada's recipe did not have mushrooms in it. I am sure I would have enjoyed this meal though-mushrooms or not. Thanks for sharing and have a great day! Tina- My husband loves to cook, even when recovering from surgery:) I'm very lucky. We will definitely add mushrooms, next time. Wow! Your husband is a trooper. I'm glad he is on the mend. Thanks to both of you for making my stomach growl :-) I hope you had a lovely Monday. I'm ready to get baking! I have a banana bread recipe that I'm excited to try tonight. Much love from Austin! Becky-Bless your hubby's heart...such a trooper! 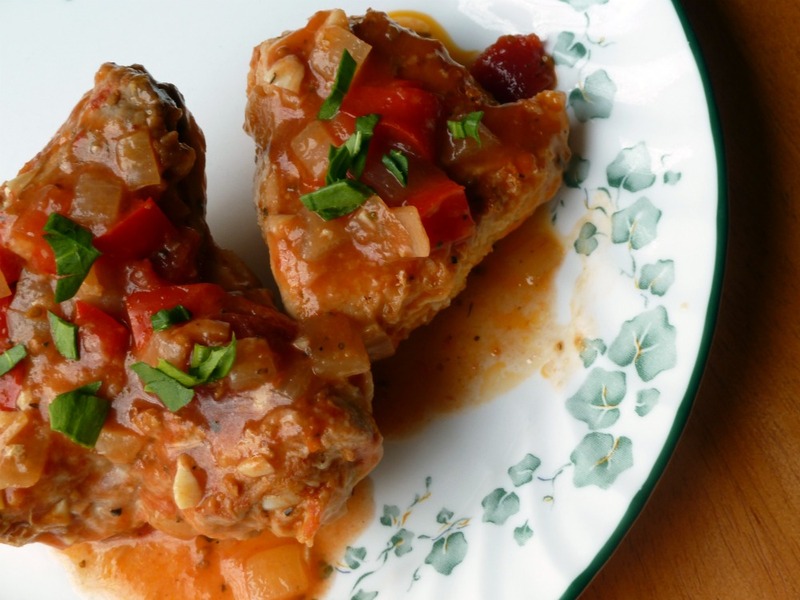 Love his version of the chicken cacciatore! So updated, and totally droolworthy and delicious! Love the photos, as well, so pretty, colorful, and totally delicious! Best wishes, for a speedy recovery! Elisabeth-thank you for the well wishes for my Hubby. This is a delicious version of cacciatore. I bet that you ahve a good one. Lizzy-the house smelled so good with all of those wonderful flavors filling the kitchen! Thank you for the well wishes for Hubby. Becky, it's great that your husband is recovering well from this surgery! I'm sure that makes you happy plus his cooking this great chicken dish for you. Cacciatore is great and his looks delicious, capers or not. Too bad they're so salt-filled! Pam-I am so pleased at his recovery from his surgery, and that he wants to cook! Lucky me. This cacciatore is so good. This chicken looks so tasty! Hope your husband is doing well. Dawn-Thank you for stopping by my blog. Hope to see you back soon. Thanks for the well wishes for my husband.